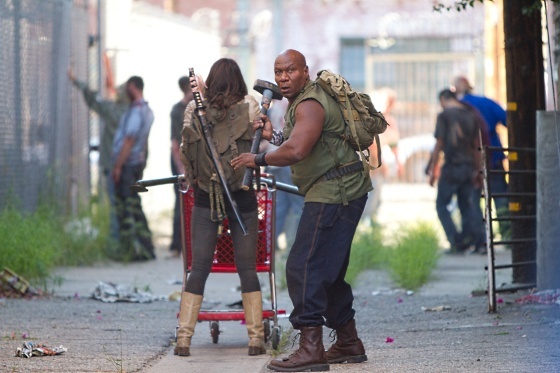 Ving Rhames might best be known as Pulp Fiction's Marsellus Wallace, but over the past seven years he's wrestled with sharks (once), piranhas (twice), and zombies (thrice). So we had to ask him: who's the scariest? You've battled zombies, sharks, and piranahas: which is the scariest foe? I'd probably have to say piranhas. I made Piranha 2, oddly enough, that'll be coming out because they come more from the ocean as the unknown. I think the fact that something small could bite you once, you could say, "Oh, that's nothing." And then you're attacked by thousands of them. So piranhas. Double the terror. Double the D's (snicker). Thankfully, they didn't double the Hoff.